Quantitative microbial risk assessment was performed to estimate the risk of gastrointestinal infections and illnesses caused by antibiotic resistant bacteria through recreational activities (e.g. kayaking, sailing, dragon-boating) in tropical, urban water bodies in Singapore. Antibiotic resistance prevalence of waterborne pathogens including Klebsiella pneumoniae, Pseudomonas aeruginosa, Salmonella spp., E. coli, and Enterococcus spp. in various water bodies were quantified using specific selective medium supplemented with commonly prescribed antibiotics in Singapore, including meropenem, ceftazidime, sulfanomide, trimethoprim, amikacin and ciprofloxacin. At least 20 isolates per samples were picked for AST susceptibility test in Vitek system to confirm the level of antibiotic multidrug resistance, and followed by PCR to detect the corresponding antibiotic resistance determinants. At least 15 samples from different locations and time points for each bacteria were used to fit suitable distribution models. Probability of infection and illness caused by these antibiotic resistant bacteria were predicted using the Crystal Ball simulation tool and burden of disease was calculated in DALYS. 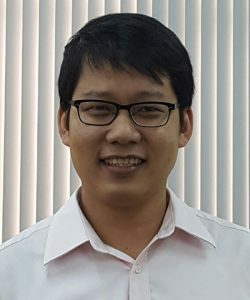 Dr Le Thai Hoang is a lecturer at the Department of Environmental Engineering and International University, Vietnam National University, Ho Chi Minh City. He received his PhD degree in Biological Engineering from the Chonbuk National University in South Korea in 2012. His research interest and specialisation are in the area of Environmental Biotechnology, Water quality, Antibiotic resistance, Infectious pathogen and Quantitative microbial risk assessment (QMRA). Prior to joining HCMIU, he spent 4 years as a postdoc research fellow at National University of Singapore from 2013 to 2016, and worked on some projects in the Environment and Water Industry program with PUB to develop the molecular microbiology techniques characterize and quantify antibiotic resistance (i.e., bacteria and genes) from various water sources including reservoirs, catchments, canals, Wastewater / NEWater / Drinking water treatment plants and marine water. He published more than 20 papers and patents reporting his discoveries in the research field of Environmental Biotechnology.